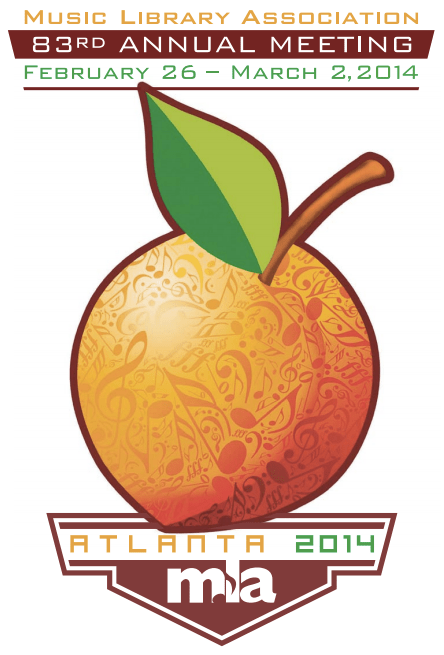 Poster for the Music Library Association’s 2014 annual meeting. This past Thursday I participated in an enjoyable opening plenary session at the Music Library Association‘s 2014 annual meeting, held in Atlanta’s Buckhead neighborhood. Joyce Clinkscales, Emory’s music librarian, organized and chaired our session. After Joyce’s introduction Nathan Rees and I each presented papers. My paper, “The Publishing History of The Sacred Harp: Tunebook Revision and Musical Culture,” introduced attendees to Sacred Harp singing and its history before discussing the tunebook’s editions and some tips on distinguishing among them. I’ve posted write-ups of these tips—on identifying editions by examining front covers and title pages or page 37—to this website. Nathan’s excellent paper considered how Sacred Harp singers express identity and ideology the visual culture of Sacred Harp singing, in particular, its shape notes and the hollow square. After Nathan and I took questions from the convention attendees, I gave an abbreviated lesson on how to sing Sacred Harp music. Then, for the remainder of the session, we sang from The Sacred Harp. In addition to the four-hundred plus music librarians present, Nathan and I were helped by twenty Atlanta-area Sacred Harp singers, who were generous enough to give up much of their Thursday morning to participate in the plenary session. The conference attendees were among the most enthusiastic group of newcomers I’ve encountered (indeed, a number had run across and even sung Sacred Harp music previously). We were able to sing nine songs from The Sacred Harp before the session concluded: “New Britain” (p. 45t in The Sacred Harp), “Old Hundred” (p. 49t), “The Golden Harp” (p. 274t), “Northfield” (p. 155), “Beech Spring” (p. 81t), “Canaan’s Land” (p. 101t), “Mear” (p. 49b), “Reynolds” (p. 225t), and “Lloyd” (p. 503). In addition to including mostly easier tunes and a few familiar melodies, our selections featured prominent Georgia contributors to The Sacred Harp, both past (B. F. White, E. J. King, and J. P. Rees) and present (Hugh McGraw and Raymond C. Hamrick). Conference attendees posted their comments, photos, and videos of the plenary session to Twitter. University of Iowa librarian Katie Buehner linked to her YouTube video of the group singing “Northfield,” which I’ve embedded below. Thanks to Joyce and Nathan for an enjoyable session, to the organizers of the conference for their support, and—most of all—to the Sacred Harp singers who made the event such a success: Laura Akerman, Amy Armstrong, Hayden Taylor Arp, Daniel Bass, Lisa Bennett, Lauren Bock, Ellen Cullpepper, Gail Denney, Philip Denney, Jeannette DePoy, Scott DePoy, Jim Neal, Erin Mills, John Plunkett, Chris Sawula, David Smead, Michael Spencer, Christine Tweedy, Eric Tweedy, and Charles Woods. Thank you for a wonderful presentation—and as you saw/heard, you had a most cooperative and appreciative audience! I ran into a couple of music librarians at a library event in New York who had attended and enjoyed your session. As they pointed out, most music librarians are musicians too.